Armm was one of many supervillains dispatched to the wedding of Barbaric and Ricochet to disrupt the ceremony. He claimed to have been looking for his brother but was unsuccessful in this search. The villains were overwhelmed by sheer numbers due to the large number of heroes that were attending the wedding. 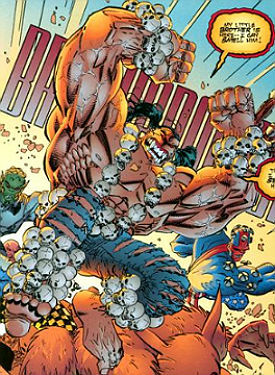 When Solar Man was waging his war upon all criminals, Mako assembled an army of his fellow Vicious Circle members for a counterattack; Armm was one of many villains present that were killed during the exchange. A large hole was punched through his torso, leaving his intestines flailing around before he died.